Your child's first dental visit should be by 1.5 years of age. If all is okay, the child does not need to be examined again until 2.5 or 3.5 years of age. Your child should never need a filling in his/her teeth if proper care is taken. Use a wet wash cloth, at bath time, to clean your infant's gum pads. 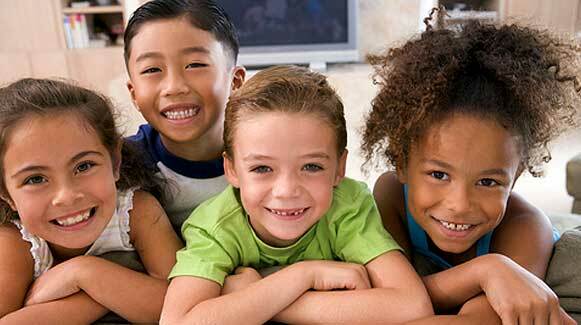 Children's teeth should be cleaned as soon as they erupt into the mouth. Use a wet wash cloth or a small, soft child-size toothbrush. Use a peas size amount of fluoride toothpaste starting after age 3. Always look at your child's teeth. Watch for color changes. Watch as new teeth erupt. Keep them clean. Plaque is a sticky film in which bacteria breed. It grows on teeth. The bacteria take about 24 hours to mature to the point where they can make acid. This acid causes cavities and makes the gums bleed. Children cannot adequately brush their own teeth until about 8 years of age. They do not have the hand-wrist coordination to clean all surfaces of their teeth. An adult should go over the child's teeth after the child has attempted brushing (at least once every 24 hours). Disclosing the plaque enables older children to brush until all the plaque is removed. A disclosing solution is recommended. Spacing between primary (baby) teeth is normal. Once-a-day flossing is required for teeth with no space between them. Use waxed floss in a floss holder (which can be obtained from our office). A child should never be left in a crib with a bottle at nap or bed time or allowed to walk around with a bottle in their mouth, no matter what is in the bottle. This practice will cause severe decay of the baby teeth or shifting of the teeth. Some medications, such as Amoxicillin, may temporarily stain the primary teeth. The stain is easily removed with light polishing by the dentist. Permanent teeth are darker (have more yellow) in color than primary teeth. They are denser and made to last a lifetime. Fluoride in the water supply decreases the chance of your child getting cavities by 60%. Your child should drink tap water to get this benefit. If it is not in your water supply, request a prescription from your child's dentist or physician. If you are not sure if your water has fluoridation, test kits are available in the office. If a child knocks a tooth completely out of his/her mouth, gently wipe or rinse tooth and place back in the socket. If it is back within 20 minutes, it is likely to reimplant. Permanent teeth have a better chance than primary teeth. If your children hits, fractures, or moves (resulting from trauma) a tooth, call your dentist immediately.